There are a number of TR808 sample packs around, from basic packs, to extensively sampled 808’s consisting of thousands of samples covering every possible nuance of the 808’s drum sounds. However, none of them have been extensively processed in the context of full production kit design, using the latest top flight processors. Thousands of static 808 samples are all very well but these days you will probably need to heavily process an 808 if you want modern, punchy drums for your production. 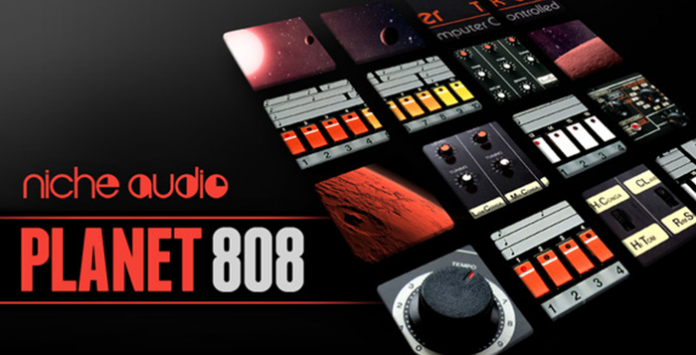 Planet TR808 gives you this in the form of inspiring, authentic, and vibe-driven 808 kits for any genre of electronic music. We created this pack for musicians and producers who understand the sum of the parts created from the same source means identity and vibe for your track! Straight from the Niche Audio factory, comes this superbly sampled, edited, and processed TR808 expansion pack. This pack has been deeply processed for Maschine 2 and Ableton live, with additional sample patches available for other soft samplers. We took our original in-house Roland TR808, and sampled each of its drum sounds multiple times in various states of tuning and decay. We then set about constructing unique 808 kits whilst processing each and every sample in context, using numerous state of the art processors to give each kit its own unique flavour. The result is a pack full of high quality, punchy, and modern 808 style kits suitable for any kind of genre including Deep House, Techno, Club, Bass House, Minimal, Tech House, Tribal, RNB and Hip Hop. Of course we haven’t forgotten some producers just want a guaranteed high-quality sampled TR808 drum machine, so we have included three untreated pure 808 sampled kits as standard. Inside you will find thirteen kits as well as two special kits consisting of an assortment of percussion and low end subs ideal for complimenting the standard kits. If you like bass heavy action this pack makes good use of of re-tuned 808 toms, congas, and kicks to create sub bombs, basses and tribal melodies. The tuned percussion gives you the ability to create pseudo melodies and add a deep tribal, percussive element to your drums. If you switch any of those sounds to keyboard mode you will find the creative doors opening wide. Try using some of the pitched congas and toms for chords and melodies, or a low tom for a sub bass line. The results can be incredibly interesting and inspiring. Each kit has four starter patterns to help you get working. The patterns have intentionally been created with a less is best policy making it more comfortable to evaluate a kit along with your track. We have four untreated 808 kits for the purists and the rest have been embellished with various degrees of processing. Dubbed or Silky could be ideal kits for a House/Deep House production. Edge takes us on a pumping, almost techno vibe with its driving sub bass. Daz, one of the most heavily processed kits could be ideal for an Electro House, or Techy style track, or how about Break – as the name suggests it could be used in a Breaks, Dub Step or 80’s style Electro track. These are just guides, essentially any of the kits can be used in any genre. Of course we make it easy for you to enjoy Planet 808 and get the full use of it for years to come. It’s fully tagged making it a breeze to find and replace sounds from the same pack or construct your own unique kits in minutes. of course the samples can be used in any of your productions so we made it easy for you to find them. is much more than a drum sample pack. This is a modern, punchy sound set using very high quality processed and non processed TR808 sounds expertly sculpted in to highly inspiring Maschine and Ableton Live kits. Ultimately this pack screams character and authenticity. Its a collection of producer ready 808 kits and sounds which which will become a go to valuable asset in the library of any producer fro years to come. Don’t forget to check out the audio demos. Every single sound and kit you hear is from the pack except for the vocal element which was added for context – provided courtesy of Marshall Jefferson’s House generation sample pack. The only processing on these demos was a bit of compression and limiting. What you hear is genuinely what you get! Try using some of the percussion and bass tones in keyboard mode. This allows you to create interesting melodic and even chord phrases from 808 tones. Maschine users can do this by simply switching Maschine to keyboard mode. Ableton users can right click the Drum Rack channel – extract chain – and then select the new drum rack panel and click ungroup to convert to a simpler instance with the required sound included.